In 2006, the town of Emporia, Kansas hosted its first Dirty Kanza 200. 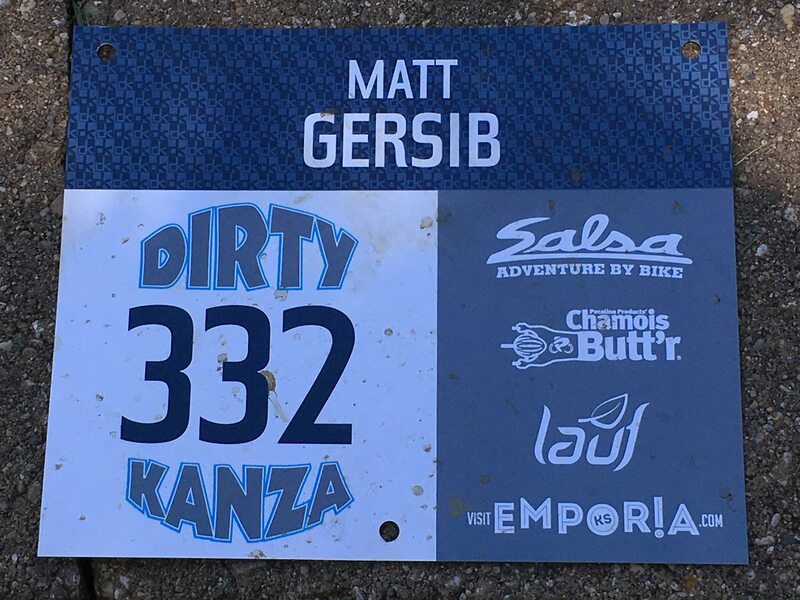 Initially a small, intimate gathering of gravel cyclists, the Dirty Kanza has since grown into one of North America’s largest and most prestigious gravel events. 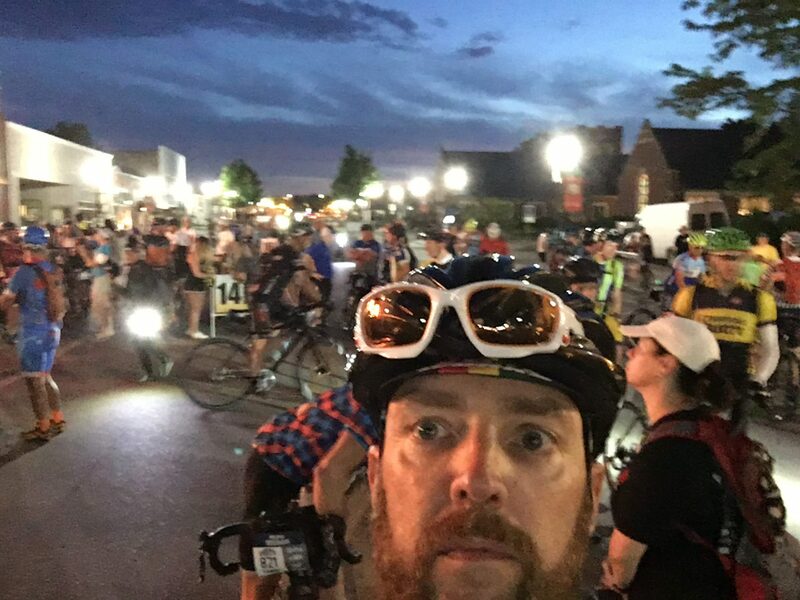 Guitar Ted captures the scene as more than 1,100 cyclists converge on the start of the 2017 Dirty Kanza 200. 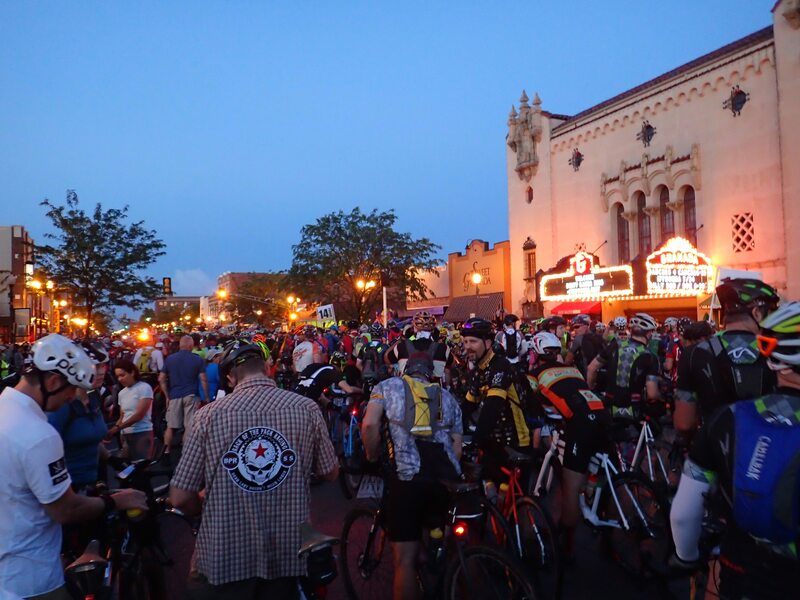 This year, the Dirty Kanza drew an international field of more than 2,000 competitors, split among 200-, 100-, 50- and 25-mile editions of the event. 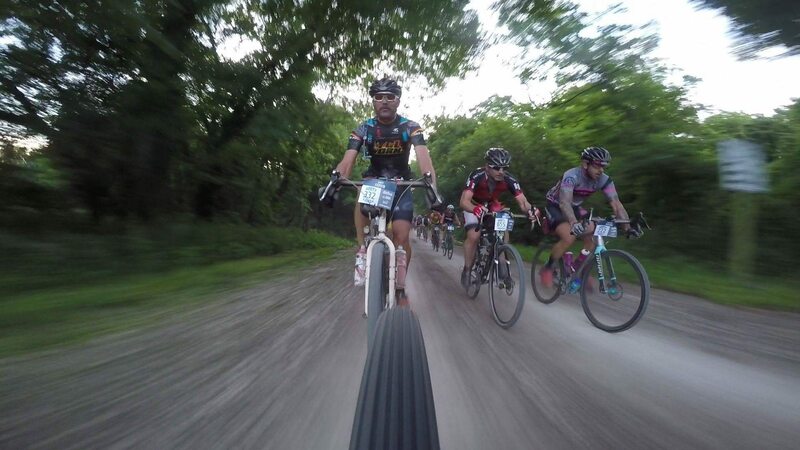 More than 1,100 cyclists toed the line for the Dirty Kanza 200. Compared to the 34 starters of the 2007 edition of the race (my first DK200), it’s amazing to see how much the event has grown. Yet despite its impressive growth, the event retains much of the personal touch that made the early editions special. It’s a credit to the people behind the DK – Jim Cummins, Kristi Mohn, Tim Mohn and LeLan Dains, and to each of the staff and volunteers helping with the event. 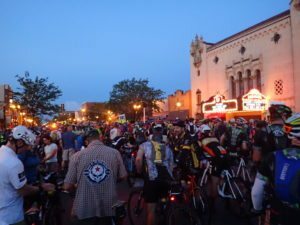 The Emporia community has benefitted from the success of the Dirty Kanza as well. And while not solely responsible for the transformation, anyone that has ridden the DK since the start can easily recognize the dramatic positive effect the event has on the community. From the increased occupancy in the downtown commercial district, to the “open arms” enthusiasm of the people in Emporia and the surrounding area, it’s clear the DK has woven itself into the culture, and the success, of the community. 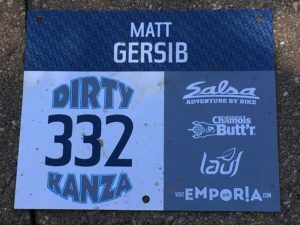 Personalized number plates give a touch of rock start status for every rider at the Dirty Kanza. Ready to roll: MG at the start line about 45 minutes before the 6:00am start. Commercial Street in downtown Emporia was already abuzz when I rolled up at about 5:15am. I surveyed the start and decided to place myself at the back of the 12-hour section. While a 12-hour finish was a bit optimistic, my plan was to start closer to the front and minimize the potential for pack-related carnage prematurely ending my day. By 5:45, the start area was filling up fast, and right on schedule, we rolled out at 6:00am. The pace near the front was fast, but I felt like I was doing a pretty good job of staying within myself and not going into the “red zone” too much. Unfortunately, I’d forgotten my heart rate chest strap, so I couldn’t tell exactly how hard I was going, so I just rode by feel and tried to enjoy the ebb and flow of the early miles. Jayson O’Mahoney’s seatpost-mounted GoPro catches MG in the first 50 miles of the 2017 Dirty Kanza 200. As it turns out, I should have just chilled out in those first 50 miles, as I paid a hefty price for my earlier effort during the second segment of the race. Fortunately, I had plenty of food and water, so during the second segment I focused on eating, drinking and simply regaining my composure. During this time however, dozens of riders easily passed me by, many of whom I wouldn’t see again until after the finish. Fortunately, my body started to come around about 15 miles from the second checkpoint. I got in with one of the groups of cyclists that had caught me from behind and my pace improved considerably. At CP2, I looked at my Garmin and realized I’d polished off the first 105 miles in less than seven hours. Not great, but not bad either. 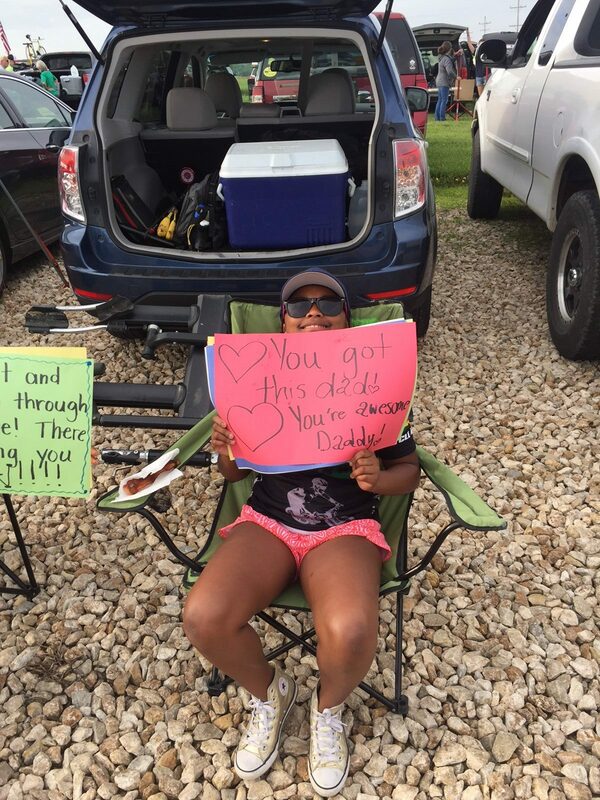 Handmade signs of encouragement greeted MG at the second checkpoint. Fortunately, my wife and girls were waiting at the second checkpoint with pizza and Red Bull. I quickly inhaled a large piece of pizza and two Red Bulls while my girls replaced my food and bottles on the bike. Once I filled my CamelBak, I rolled back out, surprised at how quickly I was back out on course. My “pit crew” was exactly what I needed. Their signs and words of encouragement worked! While I’ve heard many cyclists say the miles between the second and third checkpoints were the hardest of the race, for me they seemed to fly by. Reenergized by my family, and my food and drink consumption, I was able to resume a more “normal” pace. And while the hills were gnarly, I felt good and my bike was working awesome. I’d crawled out of the pit of despair and was once again feeling like myself. Plus, the terrain was rocky, rough, fast and fun. I was in my element. 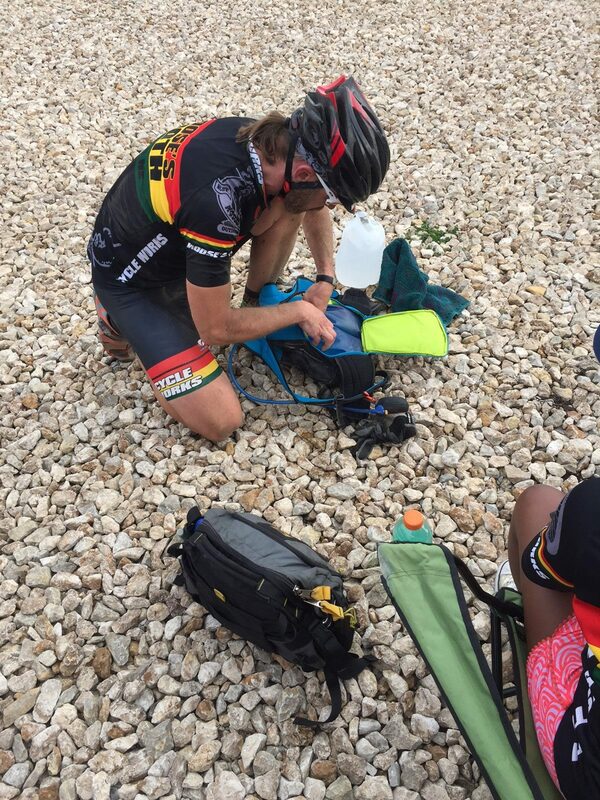 MG fills his CamelBak while his pit crew replenish his on-the-bike nutrition at the second checkpoint. Checkpoint three came and went quickly. More pizza and Red Bull, and since the final segment was just 45 miles in length, I shed my CamelBak and went to bottles only. And while I do find I drink more, and more frequently, with my CamelBak, going without it on the final push to the line was a good call. I could feel the lack of weight on each climb, and after more than 150 miles, that’s a very good thing! About half-way through the finial 45 mile segment, Quincy Simon caught me from behind. I though for sure he was going to quickly ride away from me, but instead we started trading pulls. Even with the substantial tailwind, there was still a benefit in working together, though I’m pretty sure there a few times where Quincy had to sit up and wait for me. 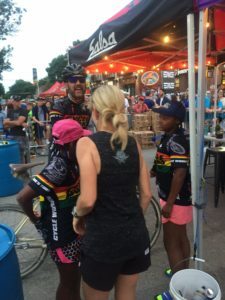 MG’s daughters and Dirty Kanza co-promoter, Kristi Mohn, greet him at the finish. Check out the Dirty Kanza Press Room for a comprehensive list of stories about the 2017 event. 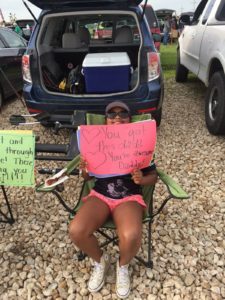 And stay tuned to the Dirty Kanza Facebook page and DirtyKanza.com for details on the 2018 event. Great write-up! I also found the 2nd leg the toughest in my first time at Kanza but really got in to a flow in the 3rd and 4th legs. My only regret is that we may never get conditions as good as this year ever again! Thanks Chris – You very well may be right about the conditions this year. They were amazing. In my seven DK200s, I don’t think we’ve ever had a tailwind like that (when it wasn’t 95+ degrees out, at least)! Congratulations on your excellent finish, Chris. I hope you’ll be back in 2018!